Posted on Sat 25.08.2018 by Ufficio di GPIC OFM Cap. The Pope paid tribute to the dignity of the homeless at the Caphucin Day Centre in Dublin today during his historic 36-hour visit to Ireland. The Capuchin religious order runs a lifeline service for those without shelter and in need of food and infant supplies. Bella Rose, 11 months old, came face-to-face with the pontiff, her mother said after he dismounted from his popemobile and entered through an unassuming back door from a narrow alleyway lined with well-wishers. The centre is non-judgmental, she said. “They ask you nothing, they don’t ask you why you want something, they don’t ask you why you want to be fed. “They don’t ask you why you want baby food and nappies, they don’t ask you anything. “You just put your name down and that is it, you are not asked anything else,” said Ms Hartigan. Addressing a gathering of the disadvantaged who use the centre, the Pope thanked them for trusting the Capuchin fathers. “They help you without taking away your dignity,” he said. Brother Kevin Crowley is a co-director at the centre. That respect extends to every person who uses the centre. Brother Kevin added: “It is very sad to think that little children have to go back to hostels in the evening time when they leave our centre. “So his concerns were the dignity and respect of each and every poor person. 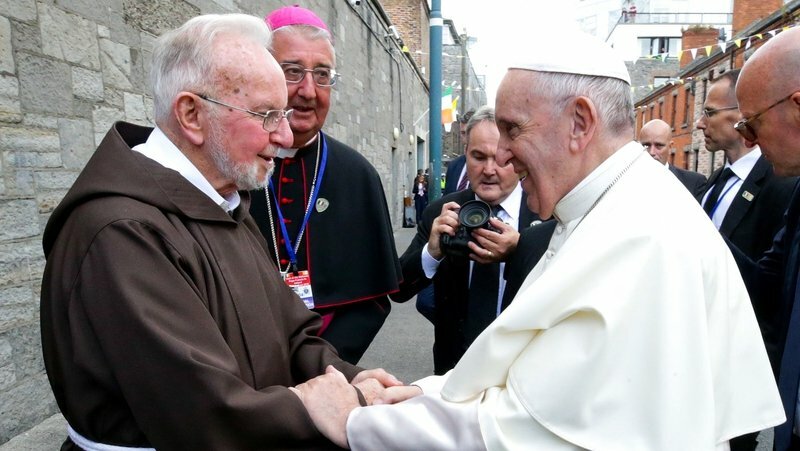 “Wherever he went he always made sure the poor were his priority and I think that is one of the greatest gifts for us here today that the Pope came to visit the centre and showed his great love for the poor and for the homeless,” said Brother Crowley. He said not enough houses were available in Dublin and urged the Irish Government to “get its act together” and build more homes. Fr Bryan Shortall, a Capuchin parish priest, recalled the leader of the world’s Catholics said some beautiful things to the friars and the homeless. “The Pope was affirming Brother Kevin and Fr Sean in what they do in the day centre, because they ask no questions, they literally have an open door, people are welcome, people will not be queried or get the third degree or quizzed, they will be welcomed.